Using salt marsh hay as winter mulch. • Continue to water shrubs and small trees, particularly evergreens, until the ground freezes. You may have to use a watering can with water from indoors as you’ll need to disconnect your water hoses from outside spigots before temperatures reach freezing. Drain out the water from all hoses, roll up them up and store them in a dry location such as a garden shed, garage, or basement. Turn off the water to outside spigots. 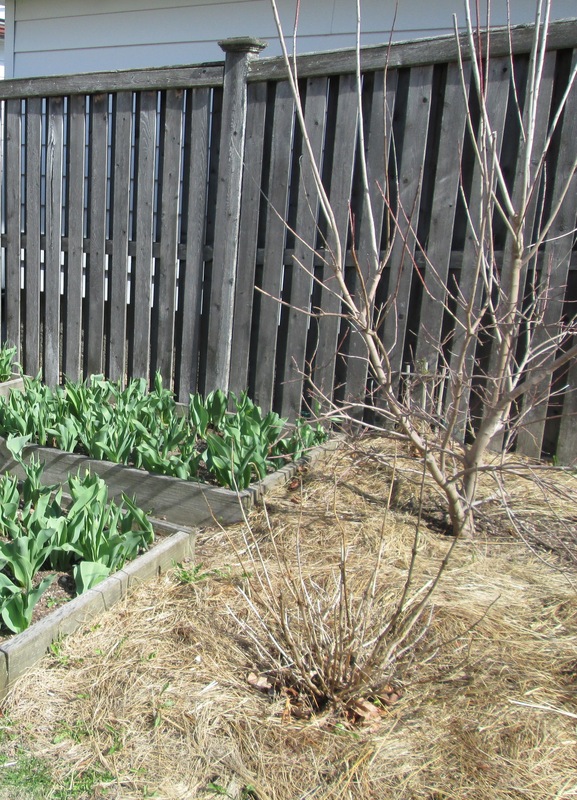 • If your garden beds need to be mulched, wait until the ground freezes to do so. Application of tree bark mulch at this time helps keep the soil at an even frozen temperature, and helps keep the ground from heaving. Put down three inches of mulch. Salt marsh hay is also a great mulch to be used for tender shrubs and perennials. You can purchase the hay at many garden centers, but do this before the end of October, or the hay may have sold out. • Wrap burlap around your evergreens and hydrangeas to shield the shrubs from strong cold winds and snow. Burlap will also protect evergreens planted near roads that will be salt sprayed by plows. Also, stuff healthy fallen leaves (not diseased leaves) between the hydrangea branches for more protection. The winter of 2014 was so harsh, that many hydrangeas did not bloom this year. • Tie Rose canes together and secure them to their supports to avoid winter wind damage. And mound one foot of soil or compost around the base of rose bushes to shield the bud union from winter harm. • Clean all garden tools: scrape off excess dirt, wipe the tool down with an old cloth or a wire brush if needed, and let it dry. Rub off any rust with oil or steel wool. Tools with a sharp metal part should be sharpened with a special sharpening tool. Then use a lubrication oil spray on metal parts to protect from rust.